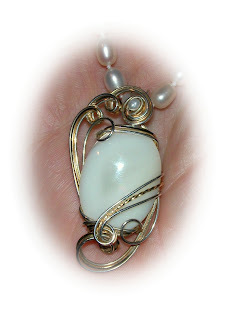 This is a MOP (mother of pearl) Cabochon set in a 14 k goldfill and sterling silver wire sculpture. A tiny pearl sits in the top swirl ...this looks wonderful on a strand of pearls. Round and square wire were used.